“What in the wide, wide world of sports is savings?” you might ask. “Money is made for spending,” you’ll insist. Those Drake tickets aren’t going to buy themselves. Someone has to drink that salted caramel Frappuccino, or else it’ll simply sit and melt on the Starbucks counter among the other lonely, forgotten fall beverages. If you can’t sit in Starbucks spending ten dollars a day to avoid studying, you demand, what’s this world coming to? Dope Drake concerts and caffeine addictions aside, you should really avoid impulse spending like the plague. Likewise, when it comes to managing sorority finances, your chapter can’t afford the vice of a short-sighted budget. Sorority treasurers should budget with a pair of binoculars--no, a telescope. That’s how far into the future you need to look to keep chapter finances healthy. Once you spot Pluto, you’re almost far enough. Let’s be honest. You’re not going to save duffel bags of cash every semester. Some semesters you’re lucky to avoid a deficit, and breaking even feels like a minor miracle. Yet even if you cudgel your social chair into saving a few bucks on off-brand Solo cups, it’s a win. Why? Because saving money is an attitude and a lifestyle. It’s a habit that, however small it starts, grows into a massive benefit for you and your sisters down the road. 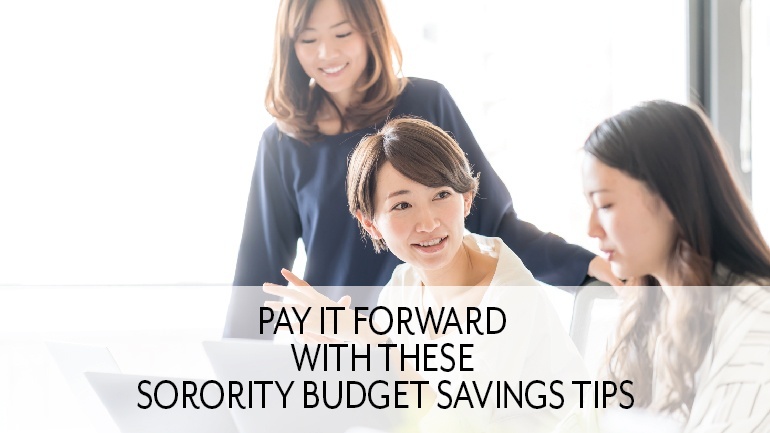 That’s why OmegaFi wants to help you Pay It Forward with These Sorority Budget Savings Tips. Just as a good sorority treasurer can teach sisters how to budget, committed personal budgeting can carry over to chapter financial management. It boils down to planning ahead. Good budgeting always includes a long-term financial plan. If you’re doing it right, you pay off your credit card within the interest-free period, your bills are paid on time, and you’ve calculated how many of those sugar-filled coffees you can afford this month--down to the penny. In fact, you’ve found a way to save a penny and place it dutifully into your piggy bank. Carry That Practice over into How You approach Chapter Dues. You always pay your membership dues on time, but once or twice you’ve had to rely on a payment plan. Even then, you needed to move things around and flatter your parents into cushioning your bank account for the semester. More importantly, you can see how budgeting to pay sorority dues early improves the chapter’s finances as well. When a treasurer knows she can rely on her sisters to pay on time or early, she can budget more confidently and precisely. This also makes planning for your sorority’s budget savings easier, since the chapter can get an accurate sense of what they’re working with, and which chapter functions will most likely produce surpluses. Here’s a tip you may groan at . . . Remember those little balance sheets that come with your check books? Okay, second question. Do you remember what checks are? Chances are you probably don’t carry checks around with you because, well, what is this, ancient Egypt? But if your parents’ tales of yesteryear are to be believed, people used to actually balance their checking accounts by hand. With a pen. Every time they wrote a check. Are they serious? Yes, they are. And you should take a hint from your parents. How do you think they’ve supported you financially all these years? The answer’s in the tip of their pen. Write your budget by hand before transferring it to a computer spreadsheet. Psychology Today reports that handwriting can help develop learning and critical thinking. Handwriting has also been shown to help improve memory. These mental benefits can help you connect better with how you plan your finances. This works best for personal finances. For sorority treasurers, writing out the entire chapter budget would take . . . forever. What are you, Bill Shakespeare? Instead, consider printing the budget once it’s completed and making margin notes with a pen. Don’t do this with every draft or you’ll be killing a lot of trees, but marking up an early draft can help give you an intimate sense of chapter finances, hopefully opening up new avenues to savings. If you’re a sorority treasurer, your first instinct is to clutch those purse strings. Being miserly is your craft, and you’re darned good at it. Social chair wants an ice sculpture at that winter holiday gala? You toss her an ice pick and wish her luck. Yet sometimes being stingy actually hurts your sorority finances. Sisters will fight tooth and nail to get what they want included in the budget, and eventually they’ll wear you down. Instead of fighting it, approach budgeting from a different angle: What are sisters willing to give up for the things they want the most? When making cuts to pay for sisters’ biggest requests, account for savings whenever possible. As the budget evolves over the course of the semester, keep the same approach throughout. Always look for savings in areas that are more disposable than others. Track and streamline your budgeting progress using sorority financial software such as OmegaFi’s Vault. This is a great way to use real-time financial reporting to find and eliminate weaknesses in your budgeting. You can also keep sisters apprised of the chapter finances in a way that helps everyone hold up their end. What sorority budget savings tips do you think could benefit other chapters? What has sorority life taught you about financial responsibility? Let’s crunch numbers in the comments below.